A place for entertainment & restaurant reviews, and all around fandom fun. 1 Bag Frozen Vegetables (any you like) – I use broccoli, cauliflower, carrot mix. Boil vegetables as directed on package then drain and set aside to cool to room temperature. Lightly grease 9 x 13 glass baking pan with margarine, butter, or nonstick spray. In large mixing bowl beat eggs and water together until well blended. Add room temperature vegetables to egg mixture and mix thoroughly. Add Garlic Pepper to egg mixture and blend well. 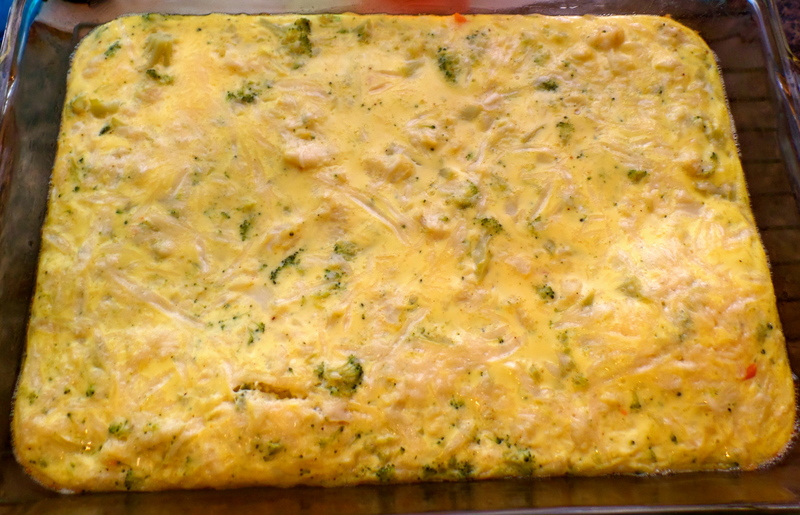 Pour egg mixture into baking pan and smooth out so it is evenly distributed in pan. Sprinkle Parmesan Cheese over top of egg mixture. Bake for 20-25 minutes or until eggs are firm.